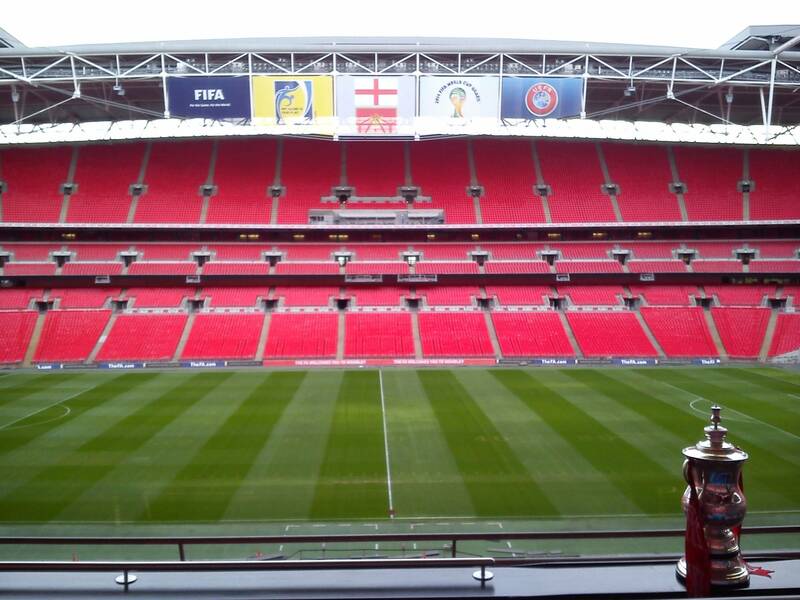 Thanks to the kind people at Casino Choice I had the opportunity to participate in a guided tour of Wembley stadium. Unfortunately, due to the lacking reliability of London’s transport system, I rocked up to what appeared to be the only finished building in the area ten minutes late for the tour, but the friendly staff were happy to allow me to join a later one. I was shepherded into the reception area under the famous crossbar Geoff Hurst’s ghost goal cannoned off in the 1966 World Cup final, where there was plenty on offer to kill the 50 minute wait: there was a counter of what I imagine would be overpriced food and drink although I neglected to check, a television with Sky Sports News running along with several others with various different types of football footage on them, three booths with FIFA 14 ready to play, a case of replica trophies and an interactive screen taking you through England’s footballing history with a 14-question quiz to fill out as you went along. The room gradually filled up to a considerable 37 people – I would imagine earlier tours may be quieter which is worth considering if you don’t want your pictures of, and generally a better look at, some of the less open areas filled with the other people on the tour – and our guide for the afternoon arrived to usher us through the home of English football. Apparently walking on a carpet is a good indicator that you are in a part of Wembley normally denied to the public, although I couldn’t help but think that, for something that cost hundreds of millions of pounds, the bowels of the stadium looked uncannily like a Holiday Inn. Our first stop via the mixed zone was the press room, where you could sit in the chair that a day later Roy Hodgson would be embarking on his latest round of expectation-lowering, then heading on to the away and home dressing rooms, adorned with the shirts of some of the players who have played there and the current England squad respectively, and sidelined by areas for warming up, complete with massage tables, tactical whiteboards, overhead netting and mini-fridges. From the dressing rooms we were ushered into the tunnel, wallpapered with pictures of the likes of John Barnes, Kevin Keegan and Alan Shearer and displaying a statue of Alf Ramsey’s head, before venturing pitchside, with another photo opportunity sitting on the English “bench”, getting an expansive view of the stadium from low and another angle as you climb the 107 steps (there are nearby lifts for those unable to take any of the stadium’s sets of stairs) to the royal box where the FA Cup was waiting for a fondle. You can get a picture printed for a fairly ridiculous Â£10 but, ultimately, how many times are you going to get to hold the FA Cup? The guide keeps thing quite light-hearted amongst the trivia, ensuring children stay interested, but in the final part of the tour it had a specific purpose in showing off the acoustics of the carefully-designed bowl. Led back to the front door, the tour lasts a bit over an hour, and you are left to survey the gift shop if you are early enough – our tour was not – and the current display of memorabilia they have amassed from each of the European Cup finals. At Â£16 it’s better value for your money than what the national team are currently serving up.